With innovative roof leak detection equipment, flat roof leaks can now be located with pinpoint accuracy and quicker than traditional methods. Traditionally the ‘trial and error’ method were used to find leaks in flat roofs. This was more guess work than anything else where possible leak sources were highlighted and repairs made to potential leak areas. This type of leak detection was unreliable and often resulted in repeated repairs until the source of the leak was found. Electronic roof testing changes all that and gives us the ability to find roof leaks faster and more accurate than ever before. Spark testing (as it’s also known) works by using electricity which follows the path of water ingress to accurately pinpoint a leak. Using this method has many benefits as opposed to traditional methods but most importantly it saves time and money wasted on costly call out charges and attempted repair costs. 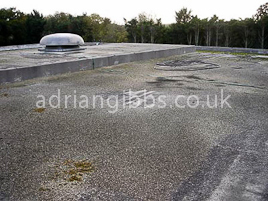 Unlike some companies offering this service we are by nature a flat roofing company who specialise in roof leaks with many years experience and knowledge of roofing systems. With our expertise we can offer the best advice on how to deal with any potential problems. We don’t expect clients to have knowledge of roofing systems so we make things easy by producing a simple report outlining any problems and then providing the best solutions.